The published standard solid ink density (SID) targets and their associated CIEL*a*b* values are designed to be be achievable by the majority of printshops with equipment in reasonable working order. They are great for standardizing presswork across the industry. However, they do not represent the best that can be achieved on press nor do they allow for competitive differentiation. 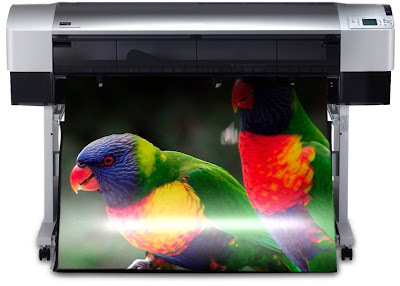 Printing to "DMaxx" - the maximum, stable, SIDs the press is capable of while using standard process inks - provides a quick and relatively easy way to add visual impact to presswork, as well as a competitive edge, when appropriate, for specific print projects. This process is best suited to sheetfed printers with an inline coater as this helps prevent setoff caused by the heavy ink densities. To prevent sheet distortion, use coated sheets in heavy text or cover basis weights. CMYK separations done with UCR rather than GCR work best with this process. You'll need about 2,000 sheets of paper and two hours press time. Create a target strip consisting of 12 tone patch steps – 1, 2, 5, 10, 25, 50, 75, 90, 95, 98, 99, and 100%, for each process color. Include four gray balance patches – typically, highlight (10C/7M/7Y), quarter-tone (25C/16M/16Y), mid-tone (50C/39M/39Y), and three-quarter-tone (75C/63M/63Y). These tone patches should be located near their nearest black tone equivalents (10K, 25K, 50K, 75K) to allow for visual comparison. 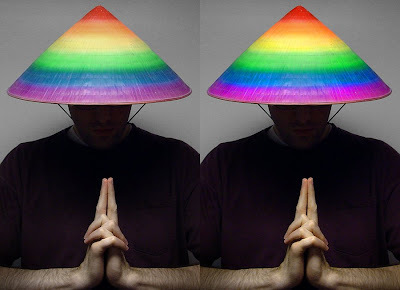 Include a standard CMYK image for visual evaluation. Arrange the targets "in-line" on your press sheet and run to your standard house SIDs. Mark the paper delivery stack "house standard" at the point the press is up to color and pull a few sheets for reference. Then gradually increase the ink densities. Try and go in 10 point steps. It is not unusual to be able to increase SIDs by 15-25 points and still maintain press stability. Don't worry about how the images and tone targets look at this point - just maintain gray balance. Maximum SIDs are arbitrarily reached at the point where the press is still stable, ink/water balance is stable, dots are still sharp (no slinging or tailing), and set-off is not a threat. Mark the paper delivery at that point as "Max Ink" and pull several sheets for reference. Measure the target tone areas of your house standard sheet and plot them on a graph comparing requested tones vs actual press sheet values. Draw a "best fit" curve through the data points. This charts the dot gain characteristic curve of your press work at normal SIDs. Now measure the tone values of the Max Ink sheet and plot them on a similar graph. Draw the best fit curve. This charts the dot gain characteristic curve of your press work at maximum SIDs. This information will be used to create a dot gain compensation curve that will be applied to plate output to compensate for the increased dot gain caused by the boosted ink density. 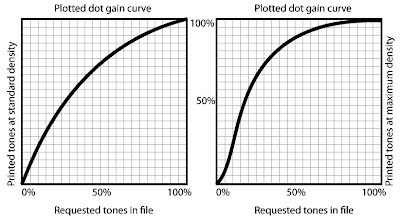 A dot gain compensation curve is derived from a plot of requested tone values against the resulting tone values. 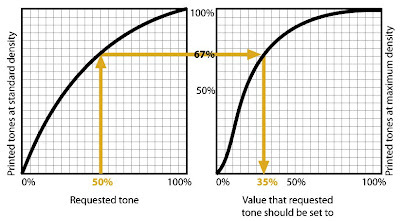 For example, if the house standard 50% requested tone resulted in a dot area of 67%, but The Max Ink measured 67% tone value corresponded to a 35% requested tone – then one of the points on your compensation curve would be: 50% = 35%. Put another way, we build a transfer curve that maps a requested tone of 50% to 35% because we know that 35% produces a 67% dot area at maximum ink density (which is what we are trying to achieve). This process would be applied to all the specified data points in order to align the tones of the High Ink presswork to the house standard. If you have a digital proofer you may want to build a profile of your DMaxx press work in order to properly set customer expectations in your proofs for this process. Alternatively you might stay with your current proofing and just tell customers that color will be boosted on press. This gives your press operators more leeway in how high they will run their SIDs. You are who you compete against.